EAT OUT with SAM: Tender Nut & Pandan Coconut Jelly, Thum Enterprice, Penang. 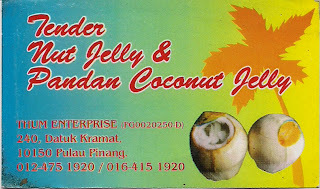 Tender Nut & Pandan Coconut Jelly, Thum Enterprice, Penang. Coconut tree is a very common sight in Malaysia. Coconut Water is the best drink to quench your thirst during the warm humid climate. How about having Pandan Coconut Jelly for a change ??? It will be great to have it as a dessert too. The taste of the pandan coconut and common coconut is totally different because Its juice is sweeter and has pandan fragrance. That is the reason why the local people use to call it 'Pandan Coconut'. 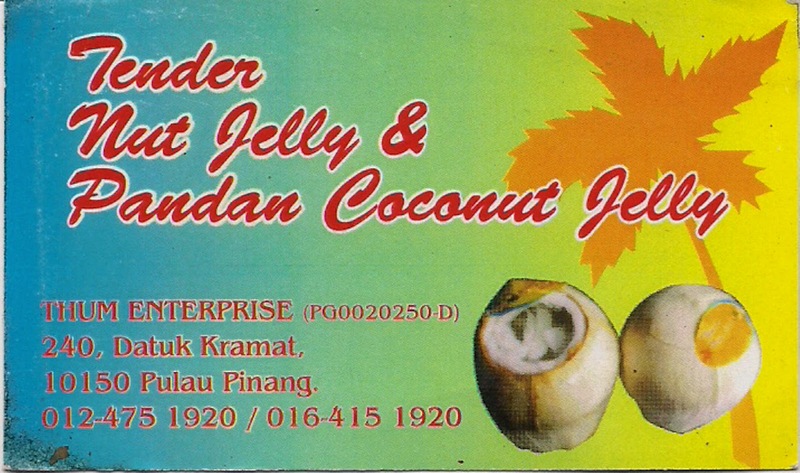 Pandan Coconut Jelly can be obtained from Thum Enterprice of No. 240, Jalan Dato Kramat, 10150. It is located at the Junction of Jalan Dato Kramat and Jalan Melaka. 2 doors away from Thum Enterprice. Pandan Coconut Jelly inside the Premises under the spinning ceiling fans. Kedai Kopi Kristal Seafood, Penang (Non-Halal). Street Food in Hatyai, Thailand. My name is Sam Ong. I am a Penangite and have been staying on Penang Island which is also known as the Pearl of Orient until todate. I mainly focus on C & G Food (Cheap & Good) & Street Hawkers Food of Penang. Eating Delicious Food is one of my Passions. This drives me to create a Food Blog to share the Delicious Penang Food with you.